How did this happen? You close your eyes for a second , June is here and May is long gone! This is going way to fast! All of you know that end of the month means monthly favourites and I am back with that. My last post of this kind was way back in February and even though I have a lot more to show you, these are my top favourites from the last three hat I have not shared with you. Most of them are beauty related as I rarely share any fashion favs. Just because I can’t get the photography on point so when I do, I will be more than happy to do a few blog posts with it. Let’s start! 1 – Zara Sunglasses – I am in love with these sunglasses. I have been wearing them non stop for a few months now. I bought them the last time I was in Madeira (around February) at Zara for €15.99. They go with everything and are so classy and stylish. I love them. Can’t find them online , guess they are from the old collection. But I found some very simillar here. 2 – Real Techniques Sculpting and Fan Brush – surprise, surprise, Real Techniques in my monthly favourites. As you know, I bought the sculpting set not long ago (maybe four or five days) but I had to mention them in my monthly favourites. I know I have not used them for that long but, girl, I know when I have a life favourite in front of me and these are two of them. Love them to pieces and you can read more about them in my previous post here. 3 – L’oreal Brow Artist Plumper – this has been my biggest secret for my full eyebrows. I never tried the Benefit but I have read many reviews that say that the results with this one is as amazing as many other high end ones. I love it, my eyebrows look fuller and perfect. I normally apply it after filling in my eyebrows with the Make Up Revolution Brow Kit. 4 – Make Up Revolution Iconic Palette 2 – I bought this palette not long ago and I adore it for the simple fact that you can either create a simple, natural, day look or a outstanding smokey eye for an evening out. Very affordable and good quality, a nice dupe to the Lorac Pro 2 Palette. Make Up Revolution as been my favourite drugstore brand when it comes to make up palettes. Love, love, love. 5 – Make Up Revolution Ultra Blush Palette Sugar & Spice – Again, Make Up Revolution. Before having this palette, I only owned one blush. One. And every time I though about buying a different one, I never knew what to go for. Then I saw this palette and I immediately though about buying it as, again, it was very affordable and also there was not only one but six blushes and two highlighters. Why buying one from L’oreal or other for the same price as this palette that gives you six blushes to choose for? Right? So I bought it and I am absolutely in love with it. My favourite of this palette is the highlighter, the fourth on the top row. It looks amazing in my skin, such a beautiful glow. I am impressed! Totally advise this palette. 6 – Gerard Cosmetics Lip Gloss in Candy Kiss – if you follow Shaaanxo on YouTube you probably have heard about this Lip Gloss. I have it, I love it, I want more. At first I wasn’t too sure as it is quite of a light pinky shade that does not suit my skin tone but if I apply it after any pink lipstick that I have, it looks stunning. I just can not get over it. Go ahead and buy it. Shaaanxo has so many discount codes that you can use and it is worth it! 7 – Revlon Color Bust Matte Lip Balm in 205 – I participated in a contest with Revlon to win a trip to Paris and I did not win. But what I received as a gift for participation was this Matte Lip Balm in a lovely pink shade that I adore. Very natural looking, easy to apply. 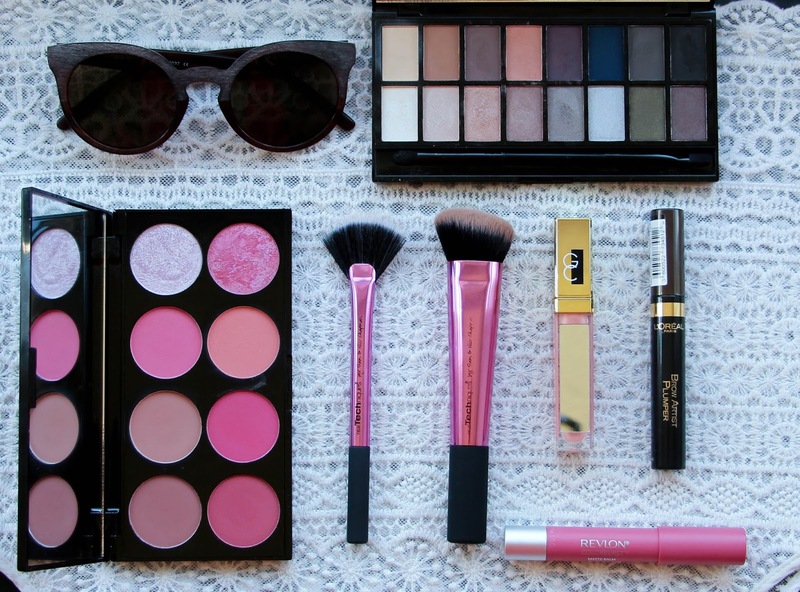 Perfect for an everyday makeup. It is my go to Lip Balm. I wear it everyday for work and I got so many compliments about it.